The frame of the inspection hole is welded from galvanized steel plate, thickness 1.5 mm.Construction of the frame is dependent on the dimension and type of the inspection hole. The inside circumference of the frame is equipped by a fire-resisting and smoke-resisting tape which stops penetration of fire and smoke through the joint between the frame and a cover. The cover is a removable part positioned in the frame and fixed by two rivets and fitted with locks (an automatic snap lock, a latch with wingknob or a FAB lock). 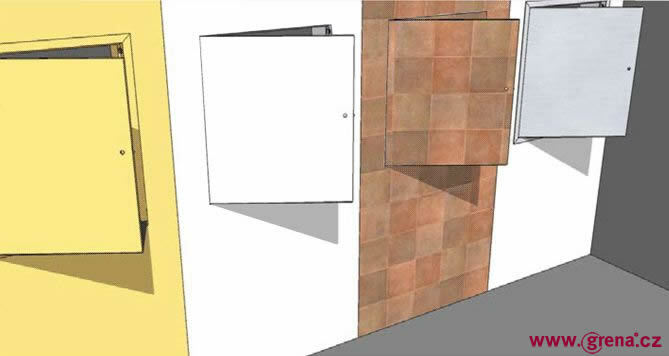 The front side of the cover can be sheet-metal filled with a plaster or ceramic wall tiling, veneer or HPL depending on a connected structure. 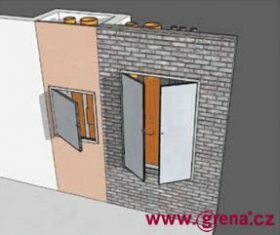 A single-leaf or double-leaf inspection hole GRENA is defined as a fire shutter and functions as fire stopping. Basic dimension range - building dimension is an outside size of the door frame." Actual building hole (or rather assembly hole) must always be approx. 5 mm bigger on each side. This area between the frame and the wall (or plasterboard structure) must be filled with fire foam or binder after fitting the frame. Sight size of the door hole is a light access hole after opening - it is always 20 mm smaller on each side. The doors are standard delivered as ´right´ ones (invisible hinges are on the right from the front view). It is necessary to order a non-standard placement of hinges. All fire-resisting inspection holes are made on the basis of an order form thus it is possible to order any size up to 1800 x 900 mm. In case of any sizes, please, do not hesitate to consult the options with our specialists.